Ok you've been thinking to get a tattoo: nothing too showy, but rather something more feminine, cute and discreet, above all, it has to be a cool design. 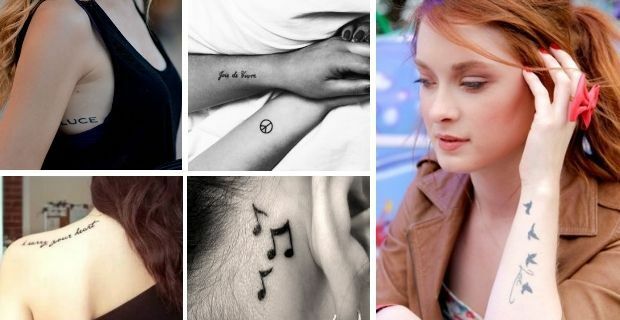 If you don't know yet what your small tattoo is going to be, then probably the best thing to do is start deciding where you would like to get it: is it going to behind your ear, on your wrist, on the side of a finger? Once you know, you can start looking for a design that suites that body part best. The thing with tattoos is that you can't really just follow what's trendy right now, because as we all know fashions come and go but a tattoo is for life. So really just follow your personal taste, and only go for it when you are really sure. No matter how big, small, hidden or showy your tattoo will be a lifetime companion, so celebrate this ancient body art with a design you really love. Find inspiration looking around, beauty is everywhere and what really matters is that you may find something that connects with yourself in the least obvious places. It could be a small flower, birds taking off, a feather, a stylised heart that remind you of something special, hopefully something good and uplifting. The inside of the wrist is a great place for small tattoos, especially if you are a sober person that would rather not show off. A tattoo there is easily concealed by a watch or bracelet, and even if you are not wearing anything on top of it, it just is a not a visible place. On the other hand, you may choose one of these pretty tattoos for a more visible place, like the side of your neck, or a finger. Just make sure, if you are tattooing your hands, that it is a design that can work well on skin that gets more wrinkly and with more creases than other part of the bodies. Take a look at our galleries, there are many cute and cool designs for small tattoos, pick what you like and take it to your tattoos artist as a starting idea. Enjoy it!